With uranium primarily used to fuel nuclear power plants for the generation of electricity, uranium demand is closely connected to the number of nuclear reactors in operation as well as under construction. Despite advances in more-efficient nuclear reactors, that can consume all the waste and depleted uranium from (current) thermal reactors, the continuing growth in these thermal reactors ensures a steady demand for mined uranium that is likely to continue for many decades. The upshot of this is that global uranium demand going forward can therefore be easily extrapolated from new build proposals, projects under construction and decommissioning schedules, over a 5-10 year timeframe. So, here are some numbers . . . According to the World Nuclear Association (WNA), as of October 1st, 2010, uranium was used in 441 nuclear reactors in 32 countries around the world. Interestingly, just 49 reactors started operation during 1996-2009! But that's soon to change. This compares favourable with a year earlier when 52 reactors were under construction; 135 reactors where planned and 295 were proposed. However, all this new building activity needs to be put into perspective with regards to the number of reactors which have closed or will be closed in the future. According to the WNA, during 1996-2009, 43 reactors were "retired", whilst they expect another 143 reactors closing by 2030. So, overall, we can expect a net increase of at least 100 reactors over the next decade. We use more uranium than we mine! 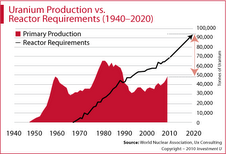 Since the early 1990s, uranium production has been less than two-thirds of annual reactor requirements (presently about 68.000 tonnes). The balance has been mainly supplied from stockpiles of uranium built up since the 1950s. These were partly commercial inventories and partly government-held strategic inventories (including material from dismantled nuclear warheads). From: "How to Make 557% from Uranium’s Next Run-up". As you can see in the chart above, according to UX Consulting, uranium reactor requirements is on the rise and has outstripped uranium production levels since 1990. In fact, they expect that . . .
Over the next 10 years, uranium demand is expected to grow to 233 million pounds annually, an average growth rate of about 3% annually. Earlier in 2010, Professor Barry Brook, who holds the Sir Hubert Wilkins Chair of Climate Change at the University of Adelaide, predicted that global demand for mined uranium will rise at least fourfold over the next 30 years, driven by rising electricity demand and scaling back on fossil fuel dependence. "The need for nuclear energy is going to be driven not only by environmental concerns and the inevitable decline of fossil fuels, but by the rising contribution of electricity for transport and the growth of electricity-consumptive technologies, such as desalination". And what's the effect on all this predicted increasing reactor build . . . Uranium prices look poised to head upward! "The supply-demand fundamentals point to the likelihood of stronger prices in the longer term." The China factor . . .
"China may purchase about 5,000 metric tons this year, more than twice as much as it consumes, building stockpiles for new reactors"
China's demand for uranium may rise to 20,000 tons a year by 2020, more than a third of the 50,572 tons mined globally last year, as it boosts output to 85 gigawatts, nine times its current capacity, according to the World Nuclear Association. What do other insiders say? Uranium will climb to an average $55 a pound next year as demand erodes supplies, according to Adam Schatzker, a metals analyst at RBC in Toronto. Max Layton, at Macquarie Bank Ltd in London, forecasts it will climb to $56.25 next year and $60 in five years. Bruce Hall of Forsys Metals Corp, believe the price of uranium could rise to over US$80/lb over the next three to four years. Some, such as Simon Tonkin of Thomas Weisel Partners, have been forecasting a supply deficit as early as 2013. While others such as Baobab Asset Management expect the deficit to occur after 2015. In both cases, the principal cause is thought to be the scale of new build in China, India, the US and Russia. If all this comes to pass, then it could drive prices up dramatically in 2011 (and onwards) and could mean that there will be little uranium left for contracting in the second half of that year. There appears to be plenty of potential for prices to go higher.